PRODUCT: 2-1/2 in. 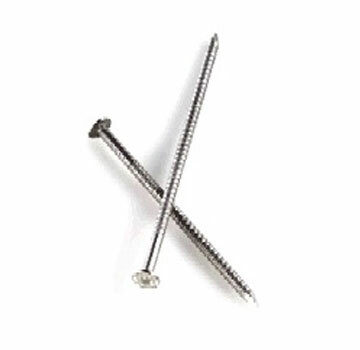 304 Stainless Steel Hand Drive 8D Shingle/Shake/Siding Nails, Ring Shank, 13 GA x 7/32" Head. 5-LB Box. Price/Box. Made in USA. (About 980 nails). Slender shanks to minimize wood splitting (13 gauge / 0.095" shank).